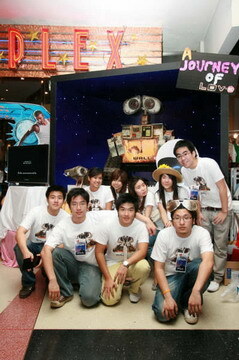 About a month before the competition, the 9 of us formed together and decided that we would like to join the Walt Disney Wall-E Marketing Competition 2008. For the first round, we had to hand in a written report on the topic of how to execute a strong integrated marketing communication plan to the target customers. This competition was open to all the students from the universities in <?xml:namespace prefix = st1 ns = "urn:schemas-microsoft-com:office:smarttags" />Thailand. 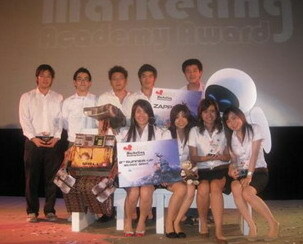 A total of more than 100 teams participated in this marketing event but there were only 10 teams who would make it through to the final round. On July 25th we went with excitement to see whether we would make it to the final rounds and when we found out that we did, we all jumped for joy. This joy did not last for very long though since we knew that the competition was not over and there were two more tasks that we had to do. First we had to present our plan to a panel of judges on the 30th of July, consisting of executives from all different types of industries, and secondly we had to execute a real marketing event at one of the Major Cineplex movie theatres on the 10thof August. We were all very proud of our performance for both of the events as we did the best we could and we had no regrets. On the 20th of August, the winners were announced and we were awarded the 2nd-runner up which we were all very proud of. Posted date: September 11, 2008 � 15:50 hrs.